Have you been searching for a way to get rid of unwanted items around your home — and perhaps even to make a little cash while doing so? 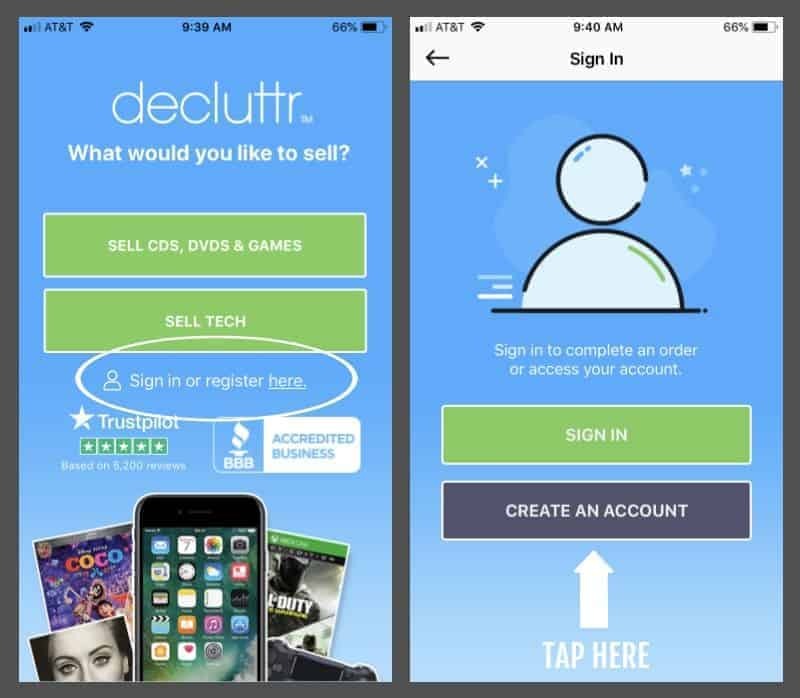 Decluttr is a relatively new app that lets you sell your unwanted media and tech on an easy to use platform; but is the Decluttr app really worth your time? Read this thorough Decluttr review and see how Decluttr compares to its competitors, like eBay. Decluttr Review: Is the Decluttr App Worth Your Time? The answer to deciding if the Decluttr app is really worth your time reads not unlike your Facebook relationship status back in college; in short, it’s complicated. 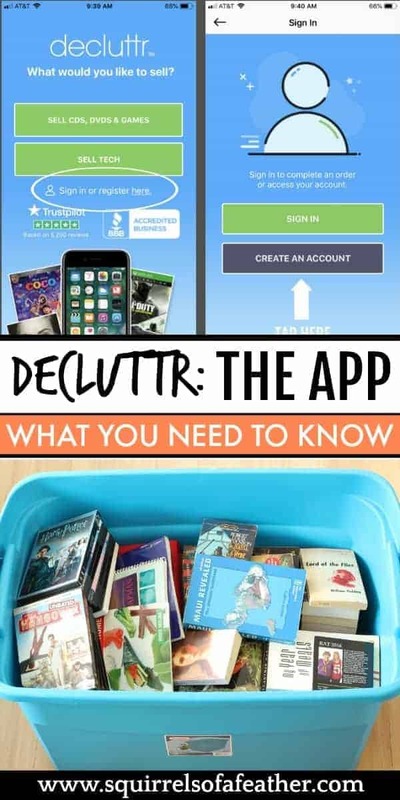 Today you will find out how to set up a Decluttr app account, how to sell items on Decluttr, compare how much money you can make on Decluttr versus it’s competitors, and finally decide if the Decluttr app is a legit way to make money. What can you sell on Decluttr? As far as rules and requirements for selling on Decluttr, there are quite a few but basically, you want the media or tech to be in good+original condition and have all original parts (like accompanying CDs for textbooks). If your items are rejected by Decluttr, they will not send them back to you (they would lose money shipping by doing so); instead, they will recycle the items (except for tech). That means that you really want to make sure your items are in good condition, because if they are rejected, not only do you not get paid, but you won’t get the item back either! Check your books for wear and tear and open all DVDs and CDs to ensure that all of the disks are still in place! Is the Decluttr app easy to use? 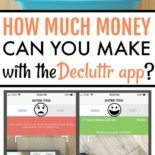 Can I make good money on the Decluttr app? The short and sweet answer to the first question is yes, the Decluttr app is very easy to use. 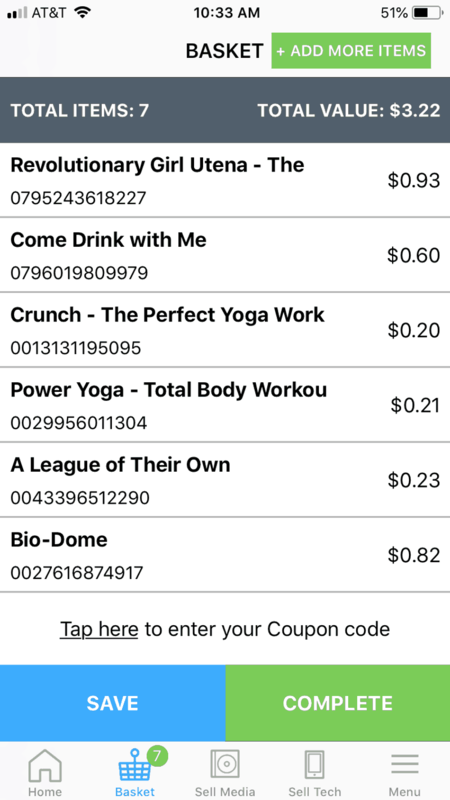 The question of how much money you can make on the app is a little less clear cut. In order to answer this question, we are going to compare two other common options for selling multi-media: eBay and resale bookstores (in our area we have Half-Price books, so that is what I am going to use as an example for books. In case you are wondering if I am qualified to make this comparison rest assured I have plenty of experience on both platforms. After using the KonMari method to declutter my home I have made over $15,000 on eBay selling my unwanted junk and maintain a 100% customer satisfaction rating for hundreds of sales. The Decluttr app is incredibly easy to use and is much more user-friendly than eBay, which has a much steeper learning curve. You can set up your entire account, scan your items for sale, and print the shipping label all from your cellphone! Here is how to get started with a Decluttr account. Simply go to the App Store on your mobile device and search for “Decluttr” and then hit “Get” and “Open” once the download has completed. Once you have opened the app you will see this screen. You can then tap “register here”, followed by “create an account”. At that point, you will see a long screen which asks you to fill in your name, street address, email address, etc. 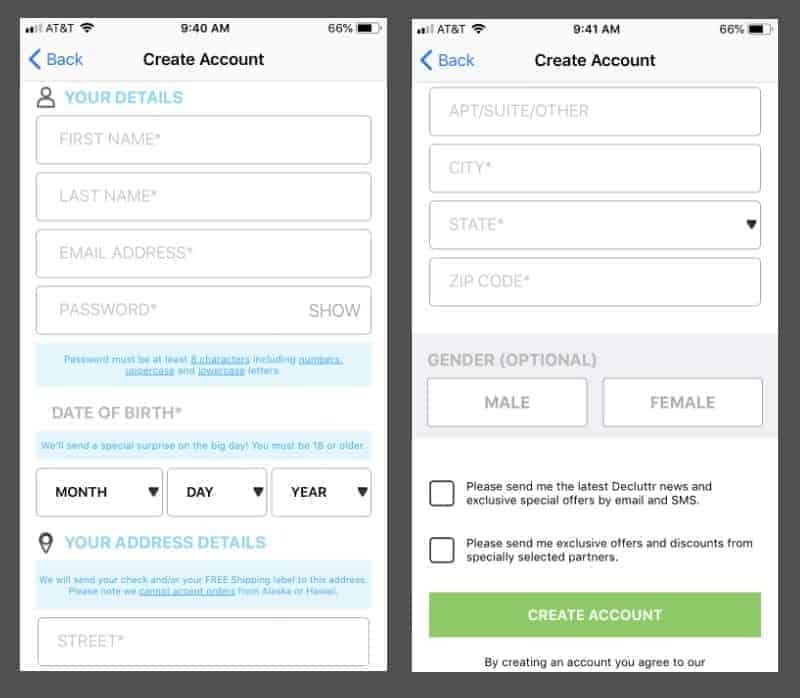 Fill in all the required information and tap “create an account”. Once you get all that completed you are ready to start selling! Now that you have your account all set up, it’s time to start selling! Grab all the items that you want to potentially sell on Decluttr and have them close at hand. 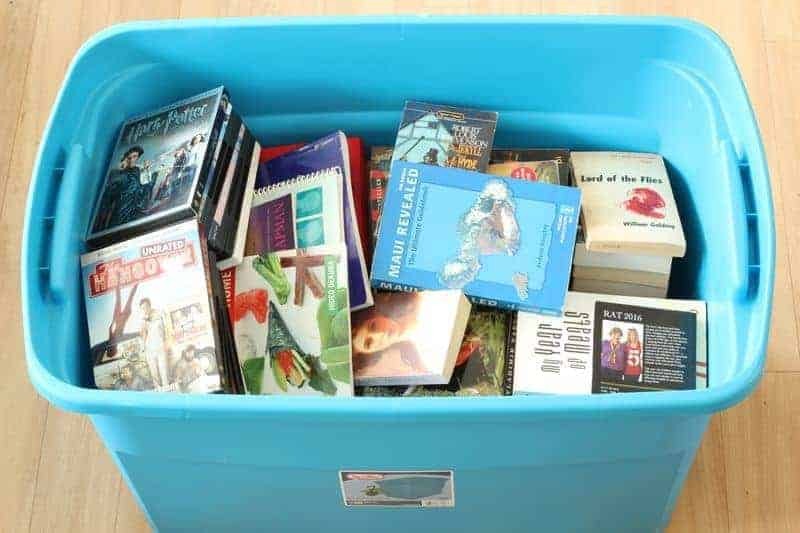 I had an entire plastic bin full of DVDs and books to go through. One by one, take your items and open a selling window for tech or media, depending on what you are selling. Unfortunately, the items that you scan may not all be accepted. Out of 17 DVDs that I scanned with the Decluttr app, only 7 were accepted — and they certainly weren’t ones that I thought would be preferred! The top row of DVDs were the ones rejected by Decluttr and the bottom row features the 7 that were accepted. You will know immediately when scanning if an item is rejected because you will see a red notification at the top. Accepted items will show the offer price from Deluttr in green! 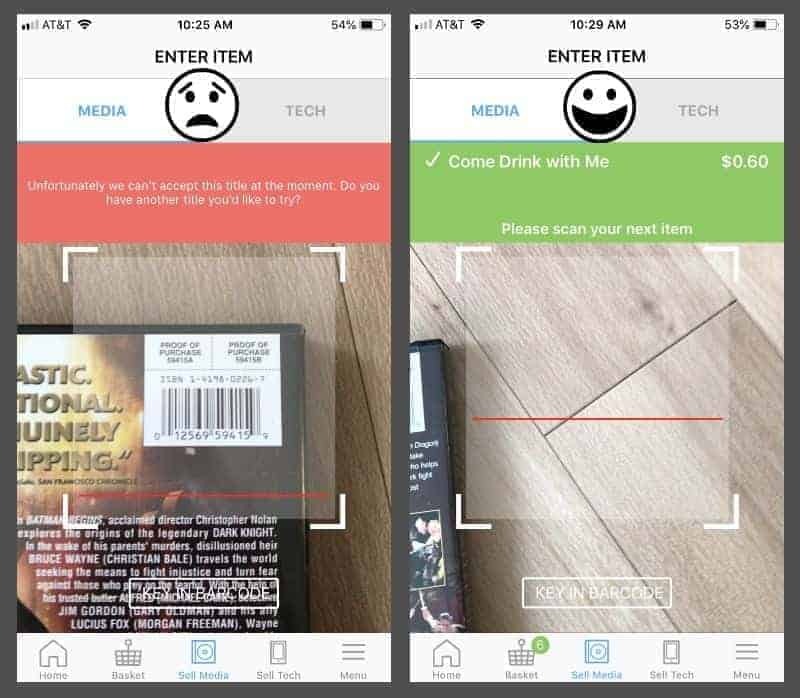 You can keep scanning and switch between media and tech for the same order. 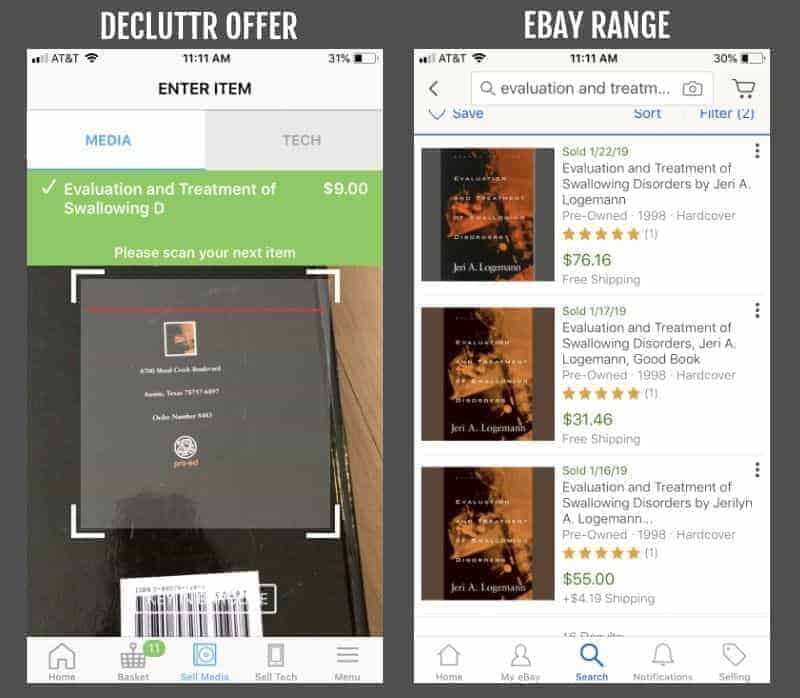 Once you have completed your scanning, you will see a final window open up with a list of the items and their offer price. To remove items from the sell list all you have to do is place your finger on the item name and drag left to see a red “delete” button. That item can then be deleted. Let’s compare how much you can make selling books, DVDs, and gaming consoles on Decluttr versus its competitor, eBay. Out of the entire bin that I had full of books, very few were accepted by Decluttr. Of the ones that were accepted, the offer price was quite low. However given that other book resale options like eBay and Half-Price books also low-ball offers, the prices that Decluttr offered wasn’t too bad. I did feel that it was a little frustrating to see book after book get rejected by Declutter. You can see here three stacks of books; the top stack was rejected by Decluttr and the bottom two stacks were accepted. However, after seeing the price offer from Decluttr I decided to separate some of the books (bottom right stack) to sell on eBay instead; here’s why. 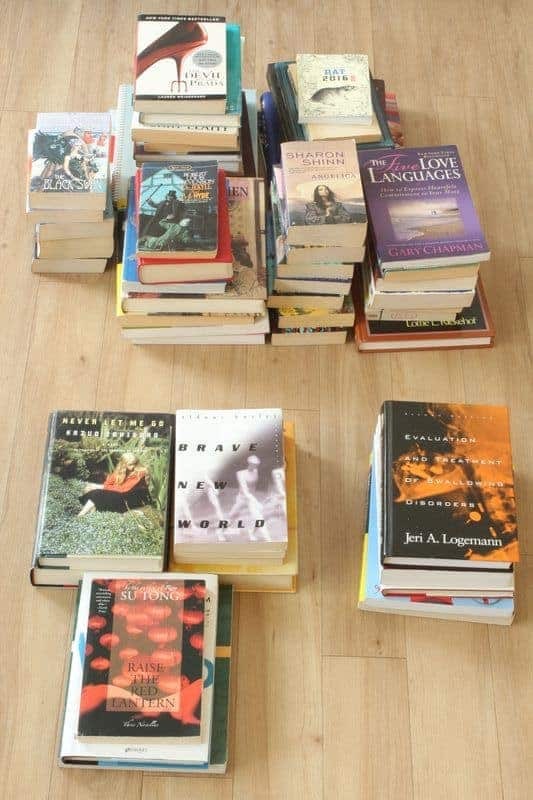 Here are examples of the books that I removed for sale on eBay instead of Decluttr. Notice the big price discrepancy. There was a pretty big difference in how much I could make selling my books in bulk on Decluttr versus selling them one by one on eBay. I discovered that if Decluttr offered me anything over $1 I should take a look at eBay and see how much more I could sell it for there. Usually, there was a pretty big price difference in favor of eBay. That is why I decided to separate my books, pulling out the ones worth $20+ on eBay. However, when decided which to use yourself, you have to consider that eBay will also take more time because you have to create each listing one-by-one, weigh the item, package the item, wait for it to sell, ship it, etc. These things take time and resources. You will need to decide for yourself if the price difference between eBay and Decluttr offsets the time you will need to put in when comparing the two platforms. When comparing Decluttr to a brick-and-mortar resale bookstore like Half Price Books, it’s a no-brainer; Decluttr wins hands down! I have taken huge boxes of excellent books to HPB and gotten only a few bucks for my troubles. Considering I got $5.47 for the 15 DVDs and books that were accepted, I thought it was not bad. I didn’t see a big price difference between one platform and another, although Decluttr did reject 10/17 DVDs the time you would need to put into creating a listing on eBay and shipping the DVDs doesn’t really seem to be worth it. I decided to donate the DVDs that were not accepted by Declutter. 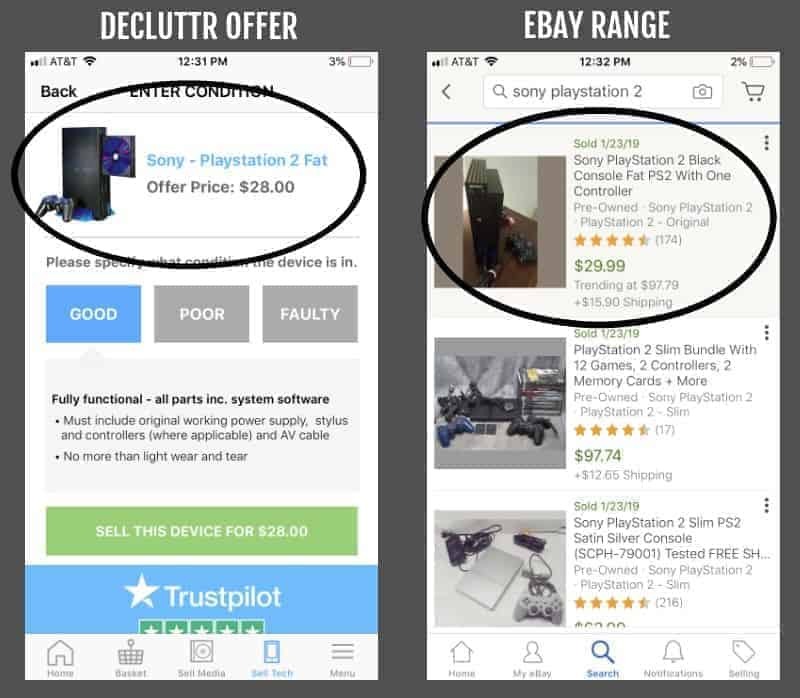 Although I had zero intention of selling my precious PlayStation 2 I decided to scope out the difference in offer prices between eBay and Decluttr for you (you’re welcome). This round was a tie; the offer prices on eBay versus Decluttr were equal. So it seems like Decluttr might be a great place to sell gaming consoles and other tech! Definitely do a cost comparison analysis if you are thinking of selling one, as prices may differ by make, model, and age. In the case of older units, eBay buyers might be a little more forgiving than Decluttr, since you will be able to note any defects or wear in the listing. After finalizing your order for selling you have several options on how you want to get paid. You can choose to get paid via PayPal, check, or direct deposit. I went with Paypal because that is how I receive my payments through eBay. I received payment once Decluttr received my shipment; the full amount, with no issues. Decluttr has both pros and cons, especially when you compare it to its competitors. Look, I know the amount I received wasn’t mind-boggling but then again I was selling a lot of low-end items. It would be different if I was looking to flip some pricier items. I hope you enjoyed this Decluttr app review! Let me know if you have any questions in the comments section below…and happy decluttering! Girl, I found a floppy disk when I was decluttering my paper! Made me feel like a real dinosaur, hahaha!